previous post: Is exchange rate depreciation inflationary? The late Canadian economist Harry Johnson, who came at the subject from the Monetarist persuasion, was correct when he wrote in 1969 (reference below) that “The adoption of flexible exchange rates would have the great advantage of freeing governments to use their instruments of domestic policy for the pursuit of domestic objectives, while at the same time removing the pressures to intervene in international trade and payments for balance-of-payments reasons.” How does this square with those who believe that even currency-issuing governments are constrained in their fiscal flexibility by an alleged balance of payments constraint. So-called progressive economists, particularly, are enamoured with the idea that Modern Monetary Theory (MMT) is flawed because it doesn’t recognise the fiscal limits imposed by the need to maintain a stable external balance. In this blog, we trace the arguments. … in response to such changes in demand and supply — including changes induced by changes in governmental policies — and normally will move only slowly and fairly predictably. Abnormally rapid and erratic movements will occur only in response to sharp and unexpected changes in circumstances; and such changes in a fixed exchange rate system would produce equally or more uncertainty- creating policy changes in the form of devaluation, deflation, or the imposition of new controls on trade and payments. It is often forgotten that the fixed exchange rate system was ultimately derailed by speculative capital flows which threatened exhaustion of the foreign exchange and gold reserves of nations carrying external deficits. Nicholas Kaldor was one of those bourgeois socialist economicsts that Cambridge University seemed to nurture in the Post War period. He became a member of the House of Lords (Baron Kaldor of Newnham) in 1974, a curious position for a ‘socialist’ to accept. The joke that was around when I was a graduate student at Manchester University in the early 1980s was that he was so unfit and large that he had had a chair on the landing between floors of the Economics building between the tea room and his office so he could rest on the way back to his office after a nice English cup of tea. That came from one of his colleagues but I never saw it on my visits to Cambridge. He was a fierce critic of Monetarism which attracted me to his ideas and writing. He was also a major contributor to the Post Keynesian literature on regional growth models, which I also found to be interesting, if not troublesome. The great revival of “monetarism” in the 1970s, culminating in the adoption of the strict prescriptions of the monetarist creed by number of Western governments the turn of the decade – particularly by President Reagan’s administration in the United States and Mrs Thatcher’s in Great Britain – will, I’m sure, go down as one of the most curious episodes in history, comparing only to the periodic outbreaks of mass hysteria (such as the witch hunts) of the Middle Ages. Indeed, I know of no other instance where an utterly false doctrine concerning the causation of economic events had such a sweeping success in a matter of a few years without any attempt to place it in the framework of accepted theory concerning the manner of operation of economic forces in a market economy. His exposure of the errors in Monetarist theory were sound but his assessment of the ideological longevity and the power of the Groupthink that emerged to sustain the anti-government mantra of Monetarism was hopelessly naive. Neo-liberalism, the modern offshoot from the 1970s Monetarism that Kaldor railed against, is, arguably, stronger than ever. The topic of today’s blog is, however, not Monetarism per se, but balance of payments constraints. Nicholas Kaldor’s earlier work on the limits of growth, which were rehearsed in a 1970 paper – The Case for Regional Policies – was published in the Scottish Journal of Political Economy and motivated further progressive efforts to define a balance of payments constraint. Kaldor’s 1970 model is that a region’s growth is driven by its capacity to export. In fact, Kaldor thought that exports were the only true ‘exogenous’ source of income growth, given that household consumption and business investment are considered to be ‘endogenously’ driven by fluctuations in (national) income itself. He then posited that export growth was driven by the combination of external income growth and the regions competitiveness, the latter being a function of wage costs and productivity. I don’t intend providing a critique of Kaldor’s 1970 article. Its applicability to a currency-issuing nation state is limited indeed as we shall see. The paper by Mark Setterfield (see references) is a good critique of Kaldor’s approach. British economist Tony Thirlwall and his, then Australian PhD student (and a personal friend of mine) Robert Dixon, extrapolated a sort of regional ‘balance of payments’ constraint from Kaldor’s framework. Of course, regions within countries don’t experience classic balance of payments problems in the sense that an exchange rate comes under pressure, but if import growth exceeds export growth and capital transfers (domestic and international) do not finance the difference, the balance of payments constraint will show up in slow growth and rising unemployment. The question clearly he sought to answer was “why does demand grow at different rates between countries”. At this point, he concluded that in “an open economy, the dominant constraint is the balance of payments” (p.429). In turn, following Kaldor, Thirlwall concluded that the determinants of this maximum growth rate was the rate at which the rest of the world was growing (which determined a nation’s exports) and the income elasticities for imports and exports. What does that all mean? The rate of growth of a nation’s exports is dependent on how fast the rest of the world, which buys those exports is growing and how such growth translates into dollar expenditure on the exports (the latter effect is the so-called income elasticity for exports). An elasticity in economics measures the percentage change in one variable (in this case, a nation’s exports) in response to a percentage change in another variable (in this case, world income growth). The higher the income elasticity for exports the greater will be the demand for a nation’s exports for a given international growth rate. The income elasticity for imports is important in this framework because it tells us by how much a nation’s imports will grow as its national income grow, given that the Keynesian model posits that imports are a direct function of national income. Thirlwall’s Law simply means that balance of payments equilibrium (balance) is maintained if export growth is more or less matched by import growth. The rate of growth in national income that delivers the result is the maximum growth rate possible. Why so? Well in this model, if a nation attempts to grow faster than that computed maximum rate (say to reduce unemployment and achieve full employment) it will experience increasing current account deficits (on the trade account), which have to be financed with foreign capital inflow. The upshot is that the nation will experience an increase its level of foreign debt. According to the argument, eventually, international capital markets will lose confidence in the nation’s ability to service the debt and this might be exacerbated by the international ratings agencies downgrading the nations debt standing. Ultimately, by breaching the growth rate permitted by the ‘balance of payments constraint’, the nation will succumb to a balance of payments crisis, which forces it to adopt recessionary policies that reduce the growth rate (and therefore imports) and push up the unemployment rate. It is only when the balance of payments position comes back into balance that international creditors will regain confidence and the nation can grow in a stable fashion, which may not be consistent with full employment. The importance of a healthy balance of payments for growth can be stated quite succinctly. If a country gets into balance of payments difficulties as it expands demand, before the short term capacity growth rate is reached, then demand must be curtailed; supply is never fully utilised; investment is discouraged; technological progress is slowed down; and a country’s goods compared to foreign goods become less desirable so worsening the balance of payments still further, and so on. A vicious circle is started. By contrast, if a country is able to expand demand up to the level of existing productive capacity, without balance of payments difficulties arising, the pressure of demand upon capacity may well raise the capacity growth rate. While Thirlwall adopted a Keynesian position, the ‘balance of payments constraint’ he defined has underpinned the obsession with export-led growth strategies. It is a case where the IMF and others have co-opted the ‘Keynesian’ literature to impose neo-liberal solutions on nations. In part, this is because ‘Keynesian’ literature was flawed. A number of results are then derived from the basis rule, which inform the actual numerical growth rate that is possible, given the balance of payments constraint. These include statements about relative inflation rates (affecting competitiveness), exchange rate movements (conditions under which depreciation increases the maximum growth rate), and the like. However, in relation to exchange rate fluctuations, Thirlwall says that “a once-for-all depreciation of the currency cannot raise the balance of payments equilibrium growth rate permanently”. There would be a temporary boost, which would dissipate. 1. To make “exports more attractive” – which in the modern narrative is about internal devaluation – austerity – cutting workers’ entitlements etc to increase international competitiveness. 2. To reduce “the income elasticity of demand for imports” – perhaps by ‘Buy Australia’ campaigns (or some such) and/or promoting import-competing industries. There have been many arcane and less so debates about whether relative prices (that is, the terms of trade) matter much in changing nations balance between exports and imports, the sophistication of a nation’s export sector (which influences whether a nation can seize export growth opportunities in higher-income products), and more. I don’t intend to address these issues as they are rather moot to the main point. I spent some time in recent years working on regional growth policies for remote indigenous communities in Northern Australia. These are regions that have little export capacity and virtually no private labour market activity and virtually no capacity to produce their own food or other consumer goods and services (including consumer durables). So in that sense, they always run large trade deficits and have little hope of doing anything else. Is it thus impossible for all the residents in those communities to be fully employed in a range of activities that aid community development – environmental care services, personal care services, or some local agricultural pursuits (subsistence even)? Surely they hit a regional ‘balance of payments constraint’ immediately and have been hitting the constraint defined by Thirlwall’s law more or less forever. Clearly there is no such constraint for those regions because they lie within a nation-state, that has currency issuing capacity. The government can ensure that residents are not only fully employed but also have first-class health care, education and other services as well as food, clothing, adequate housing and whatever else is required to be part of an inclusive national society. The fact that the Australian government only partially fulfills the material needs of these communities is not that it cannot but arises because it is obsessed with neo-liberal austerity blindness and thinks it has to run (or attempt to run) fiscal surpluses. Thirlwall’s Law has been been used to disabuse us of the notion that governments can use fiscal stimulus to ensure we achieve and sustain full employment. The argument is that as soon as the government does that it will push the nation into a balance of payments crisis, which, in turn, requires harsh austerity to bring the growth rate back into line with the external constraint. There is nothing to distinguish so-called progressives who make this argument from the neo-liberals at the IMF who also make it. Perhaps a nuance is that progressives tend to focus on import-substitution policies to reduce the balance of payments constraint while the likes of the IMF focus on expanding export potential. The nuance nonetheless. If we move from the remote indigenous community in northern Australia to Australia as a whole we learn that it has run a current account deficit of varying sizes relative to the economy for most of the period for which data is available. 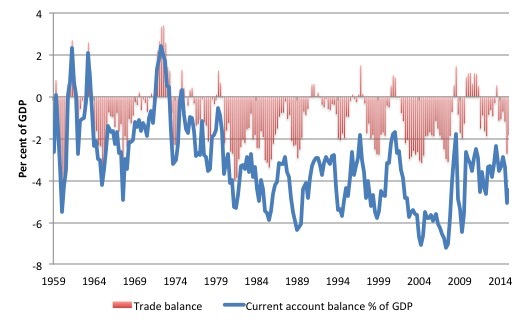 The following graph shows the Balance of Trade (as a per cent of GDP) and the Current Account balance (as a per cent of GDP) since the September-quarter 1959 up until the September-quarter 2015. The difference between the two are the net income transfers on the current account, which are always negative for Australia reflecting net interest and dividend payments abroad on foreign ownership and debt. As I demonstrated in yesterday’s blog – Is exchange rate depreciation inflationary? – the Australian exchange rate has also fluctuated widely in this period. The question is why hasn’t the growing current account deficit over the last 40 years or more precipitated a balance of payments crisis? Why hasn’t Australian real GDP growth been crippled by the so-called balance of payments constraint? Other advanced nations have also run large and persistent current account deficits for years with no crisis of the type Kaldor or Thirlwall identified in sight. What gives? One reply is that the US dollar is in world demand and so there is a capacity to absorb the trade deficits. But then how does that apply to Australia, for example? So back we go to the two-points that arise from the remote indigenous community example. First, such a community can grow because it has a strong public sector involvement. Exports are not the dominant component of aggregate spending as is assumed in the Thirlwall model via Kaldor. Second, such a community can continue to run huge and persistent trade deficits because there is capital inflow from outside the community that ‘finances’ the imports in excess of any exports the communities produce (for example, art work, crafts, some tourism). At the level of the nation state these two points are also relevant. Australia’s typical net export deficit drains growth in real GDP. The spending boost from the exports, which provides jobs and income to the sectors involved, is more than offset by the import expenditure – which is domestically-produced income that is not recycled back into expenditure on domestic goods. So a current account deficit constitutes a drain on growth. Sure enough. And negative net income transfers on the current account exacerbate that draining effect. How then does a nation grow? The answer is obvious – through private consumption and capital formation (investment) and public consumption and investment spending (the latter constituting the development and upkeep of public infrastructure). So achieving growth via domestic spending expansion to more than offset any external spending drain via a current account deficit is a straightforward proposition. How does this relate to Thirlwall’s balance of payments constraint? In a fixed exchange rate system, where the central bank has to manage its foreign currency reserves to maintain the agreed parity with other currencies, the balance of payments is a constraining influence on real GDP growth. That is one of the reasons why the Bretton Woods system broke down. External deficit nations were forced to suppress domestic demand via higher interest rates or fiscal austerity to both reduce imports and/or attract capital inflow to alleviate their balance of payments problems. The upshot was that these nations were prone to extended periods of mass unemployment, which was politically unsustainable. A nation in this situation could not run persistent external deficits and peg its currency because it would soon run out of the foreign currency reserves and/or gold stocks that were necessary under the system to defend its parity. Reflect back on the initial point made by Harry Johnson in the introduction. However, in a flexible exchange rate system, no such constraint exists. Instead, movements in the exchange rate respond to balance of payments states. A currency-issuing government can always use that capacity to ensure that all real productive resources in the nation that are for sale in the currency of issue – including all idle labour – are fully employed. Without exception. The central bank has no necessary role to play in defending the currency and therefore has no particular need to amass foreign currency reserves as it did under the fixed exchange rate system. The second point noted above related to capital inflow. Clearly, the capacity of a nation to run current account deficits on an ongoing basis of any size is reliant on the desire of foreigners to accumulate financial claims in the currency issued by that nation. These claims are reflected in the Capital account of the Balance of Payments. In that context, there is no balance of payments constraint of the type identified by Thirlwall. We continually read that nations with current account deficits (CAD) are living beyond their means and are being bailed out by foreign savings. This claim is particularly potent in the current US-China context. In MMT, this sort of claim would never make any sense. As noted above a CAD can only occur if the foreign sector desires to accumulate financial (or other) assets denominated in the currency of issue of the country with the CAD. This desire leads the foreign country (whichever it is) to deprive their own citizens of the use of their own resources (goods and services) and net ship them to the country that has the CAD, which, in turn, enjoys a net benefit (imports greater than exports). A CAD means that real benefits (imports) exceed real costs (exports) for the nation in question. This is why I always say that the CAD signifies the willingness of the citizens to ‘finance’ the local currency saving desires of the foreign sector. MMT thus turns the mainstream logic (foreigners finance our CAD) on its head in recognition of the true nature of exports and imports. Subsequently, a CAD will persist (expand and contract) as long as the foreign sector desires to accumulate local currency-denominated assets. If they lost that desire entirely, then the CAD gets squeezed down to zero. This might be painful to a nation that has grown accustomed to enjoying the excess of imports over exports. It might also happen relatively quickly. But at least we should understand why it is happening. MMT does not advocate net public spending per se. There are some growth strategies which will be unsustainable. Overall, a model of long-run growth and sustainable development requires a careful balancing of internal and external forces. In the next blog in this series I will address the issues of less developed countries which though their governments have currency-issuing capacity, have to import all their, say, food and energy. What happens then? I will outline a role for a major restructuring of the multinational institutional framework, which includes scrapping the World Bank and its other neo-liberal sibling, the IMF and establishing a progressive agency designed to ensure that balance of payments issues do not stop nations from being able to both fully employ their workforces but also ‘feed and clothe’ them adequately. We will explore the ultimate constraints on a nation’s prosperity, which is a central aspect of MMT. Johnson, H.G. (1968) ‘The Safety Valve of a Floating Exchange Rate’, The Times, December 9, 1968. Johnson, H.G. (1969) ‘The Case For Flexible Exchange Rates’, The Federal Reserve Bank of St. Louis Review, June, 12-24. Kaldor, N. (1970) ‘The Case for Regional Policies’, Scottish Journal of Political Economy, 17(3), 337-48. Setterfield, M. (1997) ‘History versus Equilibrium and the Theory of Economic Growth’, Cambridge Journal of Economics, 21, 365-378. Thirlwall, A.P. (1979) ’The Balance of Payments constraint as an explanation of international growth rate differences’, Banca Nazionale del Lavoro Quarterly Review, 128. Thirlwall, A.P. and Dixon, R.J. (1979) ‘A Model of Export Led Growth with a Balance of Payments Constraint’, in J. Bowers (ed.) Inflation, Development and Integration: Essays in Honour of A.J. Brown, Leeds: Leeds University Press. Thirlwall, A.P. (2013) ‘Kaldor’s 1970 Regional Growth Model Revisited’, KDPE 1311, University of Kent School of Economics Discussion Papers, July. Readers might be interested in Twin defecits – another mainstream myth which also references ‘Modern monetary theory in an open economy’. Is it worth describing this from the other side of the coin and describe how an export-led growth country running an export surplus in a floating system would not be able to run an export surplus unless it did save foreign currency. And furthermore show that the saving of the foreign currency is how the export-led nation injects sufficient money into its own economy (via the discounting process in the banking system). And how this leads to the explicit or implicit ‘sovereign wealth funds’. Moving capital around doesn’t seem to affect this underlying dynamic. Capital movements may be vast, but they are ultimately zero sum – unless the central bank starts reading the Volcker playbook again and acts as patsy in the market. If exports are the only ultimate source of growth, then the world economy can’t grow because the world, obviously, can’t export. The ultimately source of growth is productivity growth. In principle, a less developed country could grow without increasing its imports of productivity-enhancing capital goods if it imports know-how. For instance, instead of importing tractors to increase the productivity of farmers, it could import the know-how to make tractors and then make the tractors itself. An exception would be a country that is very poor in energy and raw materials. Economic growth requires more energy and raw materials, and if a country doesn’t have them, then it has to import them if it wants to grow. If stimulation of aggregate demand results in an increased demand for imports, then that demand can also be curtailed by import tariffs. Just as depreciation of the domestic currency reduces the demand for imports, so do import tariffs because both have the effect of making imported goods more expensive. There is nothing sacrosanct about fixed exchange rates, and there should be nothing sacrosanct about free trade. Import tariffs can be an important policy tool. It is amazing that neoliberals who scream bloody murder whenever modest import duties are imposed take huge swings in exchange rates in stride. For instance, in a few years the CAD has depreciated by about 30%. That makes imports dearer by 42.8%. Imagine the reaction if Canada had imposed a tariff of 42.8%. However, both have the same effect on imports, although not on exports. Suppose that I own a piece of virgin land that can be turned into a farm. I don’t know anything about farming and I don’t have any capital. How can I develop the farm? First, I can learn farming techniques. Then I have to persuade someone to give me credit so that I can buy machinery, seeds and fertilizer. If I can’t get credit, then the land will remain virgin, unless I rent it out or sell it, which is the equivalent of foreign direct investment. Likewise, some countries can’t really develop easily without borrowing or attracting foreign direct investment. It is generally true that people can consume more than they produce without being subsidized as long as someone is willing to lend them money or buy their assets. If I live beyond my means by using credit cards, my ability to do so ends at the moment that the credit card company refuse to increase my credit limit. However, continuously living beyond one’s means is unsustainable because there comes a moment that interest payments exceed new borrowings. If I borrow 5,000 every year at 6% to finance my consumption in excess of my income, then after 17 years the interest payments will be higher than the 5000 and I will be forced to live below my means. And furthermore, Neil, I am not sure that net exporting nations like China are consciously looking to accumulate foreign reserves in places like the US. Surely they are mainly concerned with full employment within their own borders, and exporting achieves this goal. Ultimately it’s unsustainable of course. I see it much like when you come back from a foreign holiday with a load of foreign change. You just chuck it in a drawer somewhere and forget about it. Effectively the foreign currency earned by the Chinese is their way of getting the Chinese banking system to give them Yuan – since it is an asset that the system can discount or swap. The banking system then chucks the foreign currency in a drawer and forgets about it. Looks like we have a missing close italics tag in the main piece. Thanks – I have fixed it. Another thing you may wish to discuss is ‘a positive role for multinationals’. A comment on one of your recent blogs suggested that financial markets play a role in reducing volatility (yet clearly short selling only increase it), but I think really the role of reducing volatility belongs to the multinationals in partnership with governments. When a nation’s currency depreciates significantly, the government can help clear the way for particular multinationals to take advantage of that and bring their part of supply chains to that nation. This helps to correct trade imbalances faster. Also global markets help to distribute inflation risks so that collectively nations can safely have higher rates of inflation because if all nations have higher inflation then it doesn’t affect trade. Bill, I don’t think Kaldor Was “hopelessly” naive at the time, simply naive. A number of us thought Thatcher couldn’t “possibly” win another election after the first term, so unpopular was she. That was before the Falklands War. We didn’t know and couldn’t possibly predict a war, which effectively put her on top. She couldn’t lose after that. And she didn’t. She got a 144 seat majority, if I remember rightly. Interestingly, the exit polls were wildly inaccurate, those coming out of the voting stations invariably saying that they didn’t vote for her. The best explanation I have been able to come up with, in addition to poor polling techniques, which doesn’t adequately explain the difference between the election results and the poll data, is that the voters were lying. The same thing happened when she was elected leader of the Conservative Party. Before voting, MPs said that they weren’t going to vote for her, yet when it came to the vote, they did. They had lied to the pollsters. Another explanation is that people don’t actually know how they will vote until they get into the voting booth. Of course, these two views are not incompatible. If anyone is interested in this from a Post-Keynesian perspective I recommend John Harvey’s book ‘Currencies, Capital Flows and Crises: A Post Keynesian Analysis of Exchange Rate Determination’. I think that the MMT community should pick up Harvey’s framework and integrate it into their framework. It would make MMT much more powerful. I’m surprised that they haven’t yet done it. Wray was the one who recommended the book to me! On another note though, I really must defend Kaldor here. His views were far more nuanced than the system of equations that Thirwall presented. First of all, Kaldor was originally in favour of floating exchange rates. This tied into the fact that he was a “devaluationist” in the 1960s when the sterling came under pressure. He initially made a similar argument to Harry Johnson. Kaldor probably had a point when it came to the UK. Thirlwall then tried to generalise this point into a law that holds across time and space. In this he was not only wrong but in disagreement with Kaldor. So I think there is some confusion around Kaldor’s position. He was very concerned with the case of the UK in the post-war years. He highlighted some very important “stylised facts”, as he would have called them, about the UK economy that seem to be still true today. But I don’t think that Kaldor would have generalised the model. That wasn’t his style. He knew that for different cases you need different models. rich guys who have corrupted them bias.Firms want to sell their goods ,people want to get rich. It is always about power not desire.